Our product, Grasscrete® is installed worldwide, it is a state-of-the-art, cast-in-place, monolithic, pervious concrete pavement that provides superior structural integrity, a long lifecycle and has low maintenance costs. Grasscrete is the green alternative to standard concrete surfaces for driveways parking lots, and access roads for vehicles or fire trucks. How it works: Grasscrete is made by pouring concrete over “Formers”, a tool or mold that leaves voids in the concrete, that once opened can be filled with a variety of porous materials such as vegetation or no-fines stone. The Molded Pulp Formers are made of 100% recycled materials and the system qualifies for many LEED points. Grasscrete can complement the design of structures and walkways, throughout residential and commercial spaces. Grasscrete provides a variety of landscape solutions while maintaining a sustainable, “Green” product design. As a cast-in-place, monolithic, pervious concrete pavement that is continuously reinforced to provide superior structural integrity, Grasscrete offers the ability to provide year-round access to a variety of applications without compromising surrounding aesthetics or environment. Grasscrete installation costs are significantly lower, production is increased and environmental concerns are virtually eliminated. Offering concrete services in the South Sacramento area. Garcia’s C Concrete specializes in all concrete and custom design, giving you unlimited options with your concrete floors. GCC takes no shortcuts on our product quality or time-tested application process. We use only the highest quality products available, and install them with professional expertise and attention to detail. We do free Estimates. ***************************************************************************************************************************************************************************************** Los García C Concreto se especializa en todo tipo de diseño concreto y personalizado, que le da opciones ilimitadas con sus pisos de concreto. GCC no toma atajos en nuestra calidad del producto o proceso de solicitud de la prueba del tiempo. Utilizamos sólo productos de alta calidad disponibles, y los instalamos con experiencia profesionalidad y atención hacemos estimados Gratis. Driveway professionals can install, replace and repair concrete driveways, asphalt driveways, exposed aggregate driveways and other paved areas in various materials. 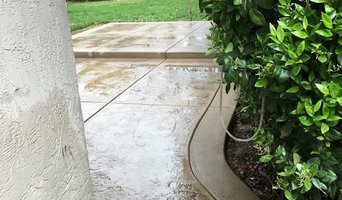 Before work begins on a new or replacement driveway or other paved area, a Sacramento, CA driveway professional will assess your property’s grade, soil and drainage. They will then help you choose from a range of poured surfaces and driveway pavers, based on your home’s style and environment. Next, they will prepare the site and operate any heavy machinery needed to build the driveway or move pavers – however, construction may not be able to happen until after other contractors have finished. Find a driveway and paving contractor on Houzz. Narrow your search in the Professionals section of the website to Sacramento, CA Driveways. You may also look through Sacramento, CA photos to find examples of driveways and paving that you like, then contact the paving professional or contractor who worked on them.